OPI made waves in the nail world last year with their crackled nail polish. It's a very rock and roll look that not everyone will get. It has a "chipped" look and is surprisingly versatile. Now, it's probably not the type of polish you would wear in a professional work place that has a strict dress code, or a school. But its perfect for the weekend. Sally Hansen have released their version recently and if you haven't seen it at the shops, that's because its probably sold out already! I went to 6 stores and only 3 had any left. The black and white were left at my local pharmacy. So I went into Priceline and they had a few colours remaining. Sadly they were out of the gold, which is the one I had my heart set on. So I bought the silver instead from there. On my way out I went back to one of the pharmacies, and they had sold out of the black!! It was probably an hour later.....so get in quick or someone else will get away with the colour you want! The great thing is they are only AU$9.95. I've used Sally Hansen Xtreme Wear in Fuchsia Power (320) as my base, and did 2 coats of polish. Secondly I've added the Crackle Coat in Fractured Foil (03) on top. Then I have applied the Sally Hansen Xtreme Wear in Invisible (100) as my top coat. I found once I applied a clear base coat, it really made the silver shine. It also helps to keep the nail polish from getting chipped or peeling. Its really important to make sure your base coat is completely dry. 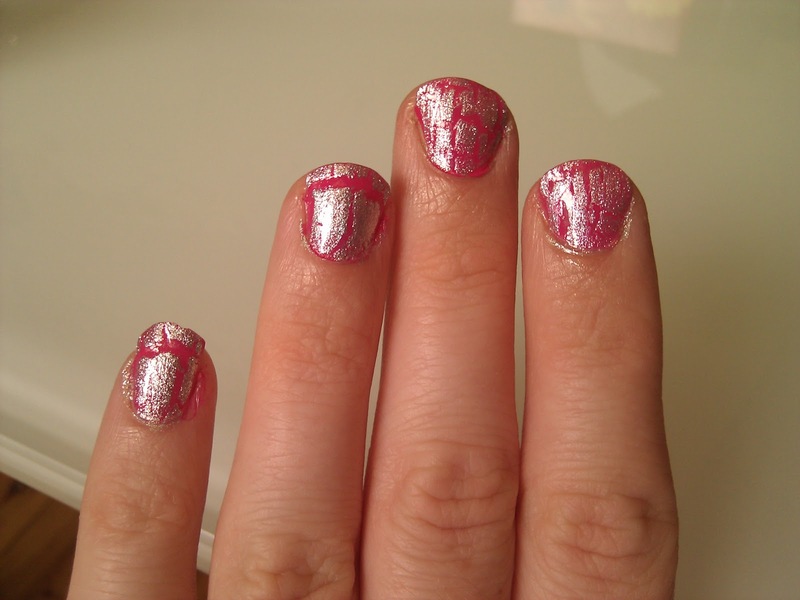 On my first two fingers I applied a heavier coat of the crackle and on the other two fingers I applied a lighter coat. Personally I love the lighter application as there more crackle. I also tried it out with another colour. I'm a bit obsessed with turquoise at the moment. 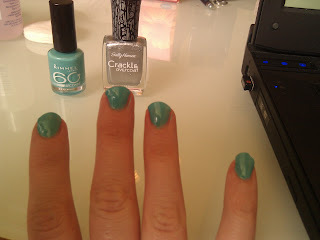 So I applied two coats of Rimmel 60 seconds Nail Polish in Bonzai (832), then applied the crackle. The great thing with this polish is the colour possibilities are endless. I chose to buy the silver as I knew it would go with polishes I already had. They also have a gorgeous purple, pink and blue crackle polish, but I thought getting a neutral colour was better value for money. Honestly I wasn't sure if I would like the crackle look so if you are like me, try a neutral colour first that you can use with a few different colours. Then if you love it, you can go all out with crazy colours. I'm now obsessed and cant wait to get more. Hopefully I will find the gold crackle next, along with black. 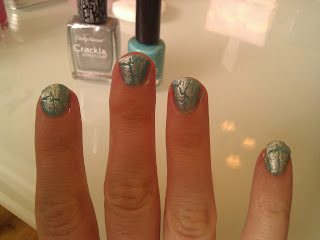 Have you tried any crackle polishes? Or do you prefer a cleaner one toned polish? I'll update you with more colours as I get them.